On September 11th, 2001, our world and our lives were changed forever. The Gramercy Park Block Association was privileged to help in the days and months following September 11th. Our relief effort at the 13th Precinct command center included preparing and serving thousands of meals, providing shelter and distributing critical supplies to our police, fire and emergency units, and to hundreds of visiting police, fire and rescue units who poured into New York from around the country to assist and support workers at Ground Zero. The bonds we formed then became permanent, and our support for first reponders continues to this day. E-MEN: Video series developed by GPBA, documenting NYPD Emergency Service Detectives' memories of 14 fellow officers who died on 9/11. NYPD Partnership: Widow of murdered NYPD Det. Wenjian Liu gives birth to daughter 2 1/2 years after this death. Trustees of Gramercy Park: Park gravel recently raked, blown and rolled. Remember the Fallen - Heartbreaking story of those left behind when officers are killed in the line of duty, and Blue Lives Matter, the organization helping them. Produced by Antonio Bolfo, video includes NYPD widows GPBA honored at our June event at the National Arts Club: Lisa Tuozzolo, Maritza Ramos and Pei Xia Chen, widow of Det. Wenjian Liu. We are proud of Gramercy Park Neighbor Dr. Henry Jarecki! German President Joachim Gauck awards Dr. Jarecki "Officer's Cross of the Order of Merit" of the Federal Republic of Germany for contributions to German-American relations, and to both countries' scholar rescue programs. Gramercy Park Neighbor Eyal Ofer one of " real estate's quiet money backers"
On Thursday June 9th, the GPBA remembered murdered NYPD Officers Det. Randolph Holder, Det. Joseph Lemm and P.O. David Hofer at its annual members event sponsored by the National Arts Club. Gramercy Park Gardener Amando Flores' recommendations in NY Mag's "The 7 Best Garden Tools to Buy This Growing Season"
The GPBA acts as the liaison between the Park and neighborhood and various New York City agencies, such as the Landmarks Preservation Commission, the Department of Transportation, the Department of Sanitation and ...Read more. 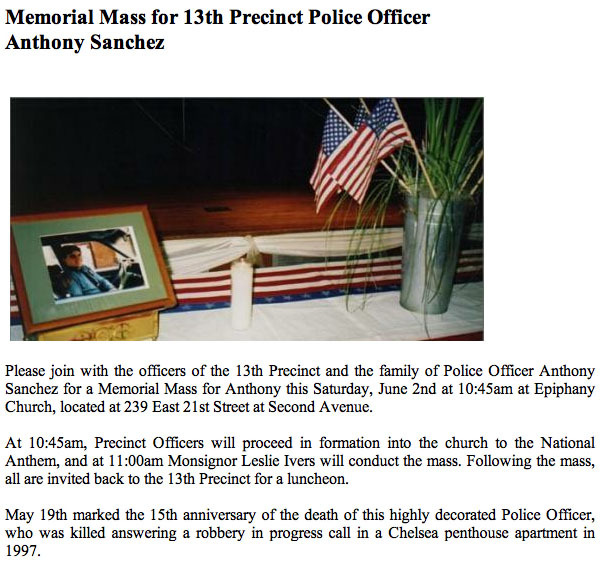 May 19, 1997 - 13th Precinct Police Officer Anthony Sanchez Fatally Shot Responding to Robbery on 17th Street P.O. Anthony Sanchez, his partner P.O. Roy Ruland and 3 other officers responded to a robbery in progress at 138 W 17th St ...Click here to read more. 2nd Ave at 20th St. In continuing our series highlighting GPBA's major accomplishments during the past 20 years, this week we focus on our role in the 1996 cleanup of Gramercy Park Services Methadone Clinic located at 253 Third Ave (btw 20th and 21st, above Subway) ...Click here to read more. Last week, we described the GPBA's role in the takeover and rehabilitation of the Kenmore. To celebrate the GPBA's 20-year history, we are continuing with a series of emails highlighting our major accomplishments...Click here to read more. Last week the New York Times published an article "Takeover of Kenmore Hotel: Informer Recalls His Complicity". The Gramercy Park Block Association played a major role in the takeover and rehabilitation of the Kenmore. Below is a timeline describing the GPBA's involvement ...Click here to read more. The Gramercy Park Block Association invites you to the 13th Precinct Community Council Meeting - Tues. 6/17, 6:30 p.m. 13th Precinct station house E 21st St between 2nd and 3rd avenues ...Click here to read more. Since a major focus of the GPBA's mission is Crime Prevention, we are proud to be a Community Partner of the NYPD 13th Precinct, located at 231 E 21st St. They have provided us with essential information regarding 911 emergency calls ...Click here to read more. The Flatiron/23rd Street Partnership and TD Bank are inviting area residents and business owners to their Speaker Series featuring 13th Precinct Commanding Officer, Deputy Inspector David Ehrenberg...Click here to read more. 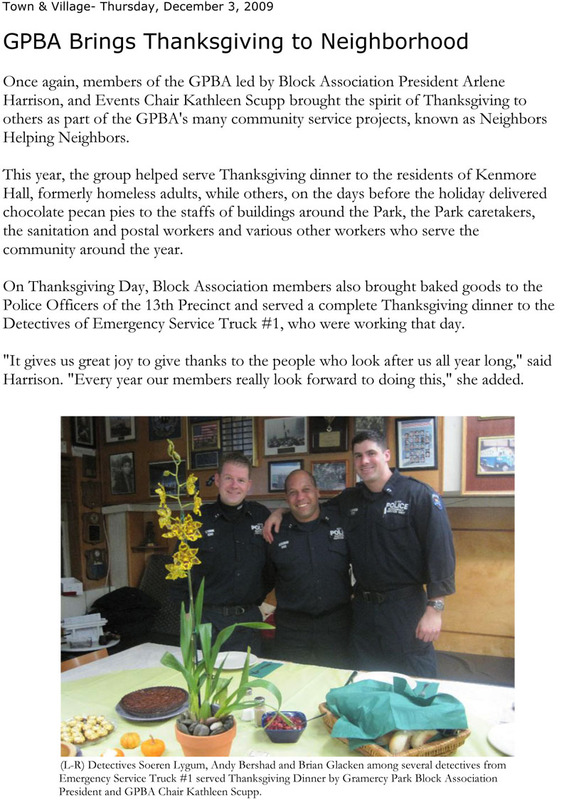 Since a major focus of the GPBA's mission is Public Safety and Crime Prevention, we work closely with the NYPD 13th Precinct. The 13th Precinct Community Council meets with neighbors every 3rd Tuesday of the month at the Precinct at 230 E 21st ...Click here to read more. Emergency Service Truck #1 Detectives Brian Glacken, Larry Olivetti, Andy Beshar, and Rob Stosch in front of the 13th Precinct's Remembrance Garden planted by the GPBA. Following 9/11, the GPBA planted a Remembrance Garden in front of the 13th Precinct ...Click here to read more. The winter's most recent snowstorm thwarted the 13th Precinct Community Council's monthly meeting last week, but the weather does not seem to have thwarted criminals in the neighborhood ...Click here to read more. 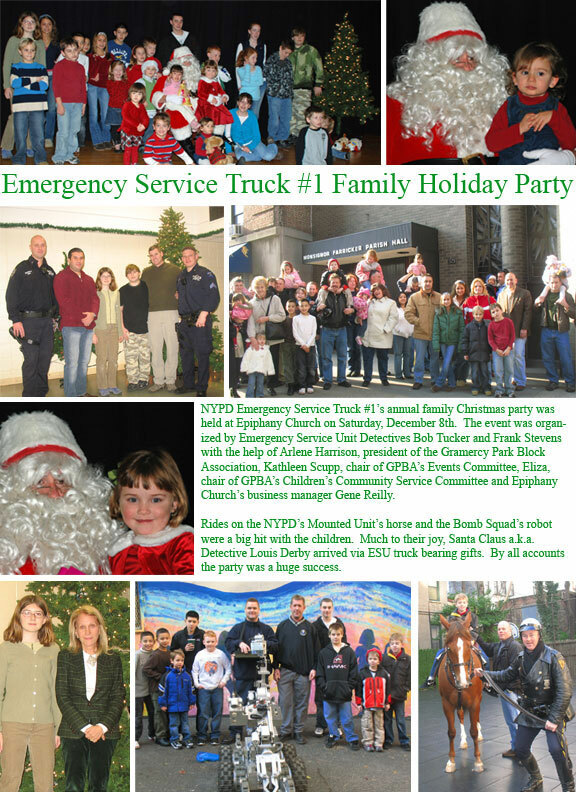 NYPD Emergency Service Truck #1's Annual Family Christmas party was held at Epiphany Church on Sunday, December 15th. 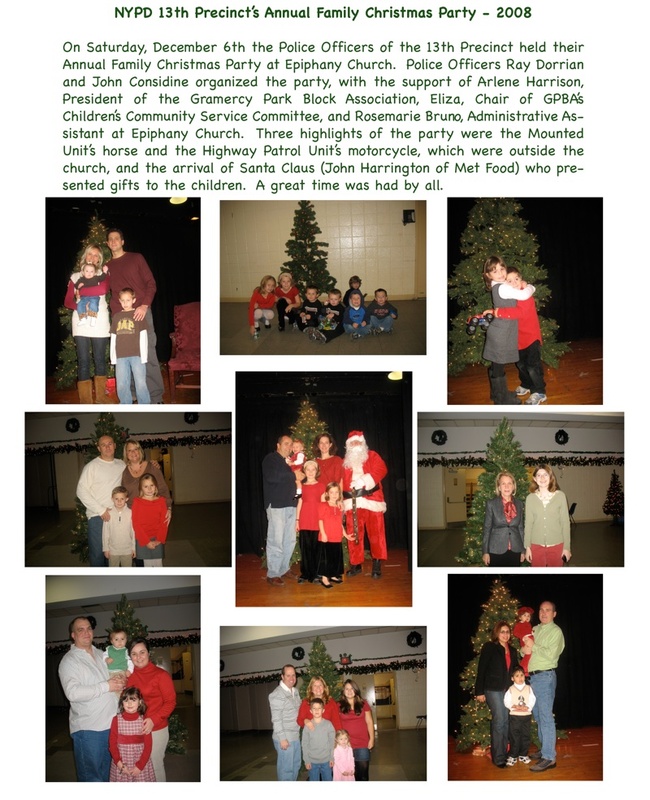 The event was a group effort between ESU Truck #1, Epiphany Church and The Gramercy Park Block Association. ...Click here to read more. The 13th Precinct recently held their Annual Family Holiday Party at Epiphany Church's Monsignor Farriker Hall on Saturday, December 7th. The event team included Detective Ray Dorrian and Police Officers John Considine and Vinnie Arlotta ...Click here to read more. The 13th Precinct saw a 35 percent spike in crime over the last month, mostly in burglaries and grand larcenies. The stats were revealed by Deputy Inspector Dave Ehrenberg at a meeting of the 13th Precinct Community Council on Tuesday ...Click here to read more. Police officers of the 13th Precinct and Emergency Service Unit Truck 1, along with members of the community, gathered in front of the precinct's stationhouse on Wednesday to commemorate the twelfth anniversary of the September 11th ...Click here to read more. Our community's response to the 9/11 World Trade Center disaster - a four-part booklet of articles and photos. Part 1 includes speech given by Arlene Harrison each year for several years at the GPBA's Annual World Trade Center Remembrance ...Click here to read more. Please join us for the World Trade Center Remembrance Ceremony on Wednesday, September 11, 2013 at 8:30AM at the 13th Precinct ...Click here to read more. Stores and supermarkets are popular places for thieves to prowl. Shoppers often use the child seat of shopping cart to hold their purse and other personal items and this offers an opportunity for a thief. ...Click here to read more. Since a major focus of the GPBA is crime prevention and public safety, we thought the following information from the NYPD about recovering lost or stolen cell phones might be of interest ...Click here to read more. Since a major focus of the GPBA is crime prevention and public safety, each year we sponsor the 13th Precinct's National Night Out Against Crime, which this year celebrated it's 30th anniversary ...Click here to read more. 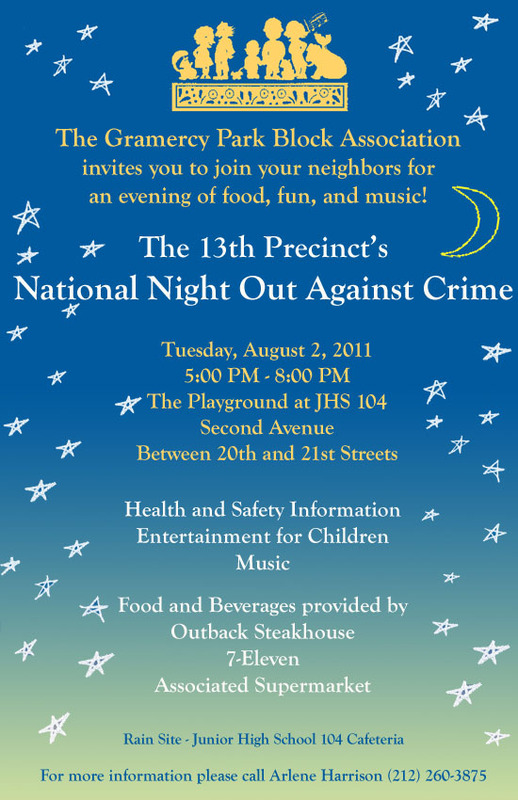 The 13th Precinct's National Night Out Against Crime - TONIGHT! Please join us tonight for the 30th Anniversary of National Night Out Against Crime! There will be music, entertainment and fun for the whole family, including clowns and caricaturists! 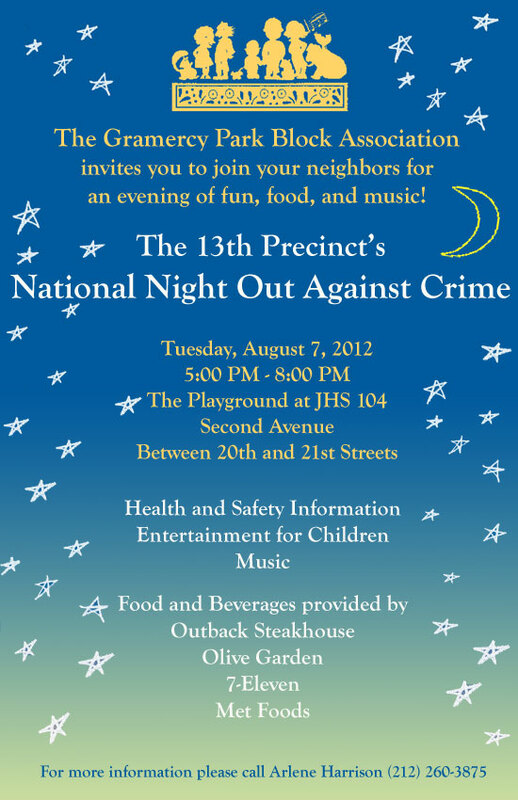 The GPBA invites you to the 13th Precinct's National Night Out Against Crime. Tuesday, August 6, 2013, 5-8pm, at the JHS 104 Playground, Second Avenue between 20th and 21st Streets ...Click here to read more. Credit Card Fraud is a serious criminal matter that impacts millions of consumers around the world. What can we do to help make sure we are not victimized? Stores and credit card companies don't always require ...Click here to read more. Gramercy Park Block Association President Arlene Harrison delivered 150 flower bouquets to 13th Precinct Police Officers, Emergency Service Unit Truck #1 ...Click here to read more. Since a focus of the GPBA mission is safety, security and quality of life, we'd like to pass the important information below from the NYPD Community Affairs Bureau. ...Click here to read more. In the last community council meeting before the summer on Tuesday evening, the Manhattan CERT team gave their presentation about the new hurricane evacuation zone maps, which were released earlier that day. Deputy Chief of the Manhattan ...Click here to read more. The 13th Precinct Community Council will host its monthly meeting on Tuesday, June 18th at 6:30 p.m. The meeting is open to the public, and officers from the 13th Precinct will give updates on crime ...Click here to read more. Deception Burglary - a burglary committed by a person(s) that gains entry to the home by posing as an employee of a particular company. This impersonation includes utility companies, delivery companies ...Click here to read more. The 13th Precinct Community Council will host its monthly meeting on Tuesday, May 21st at 6:30 p.m. The meeting is open to the public, and officers from the 13th Precinct will give updates on crime in the neighborhood and will hear concerns from ...Click here to read more. ATM Shoulder Surfing - the act of using multiple tactics' to distract or manipulate a victim in order to obtain their ATM "PIN" number. The main goal is to obtain currency from the targeted victim without them knowing ...Click here to read more. We can all see from the recent tragedy at the Boston Marathon how critical video surveillance systems are in fighting crime. 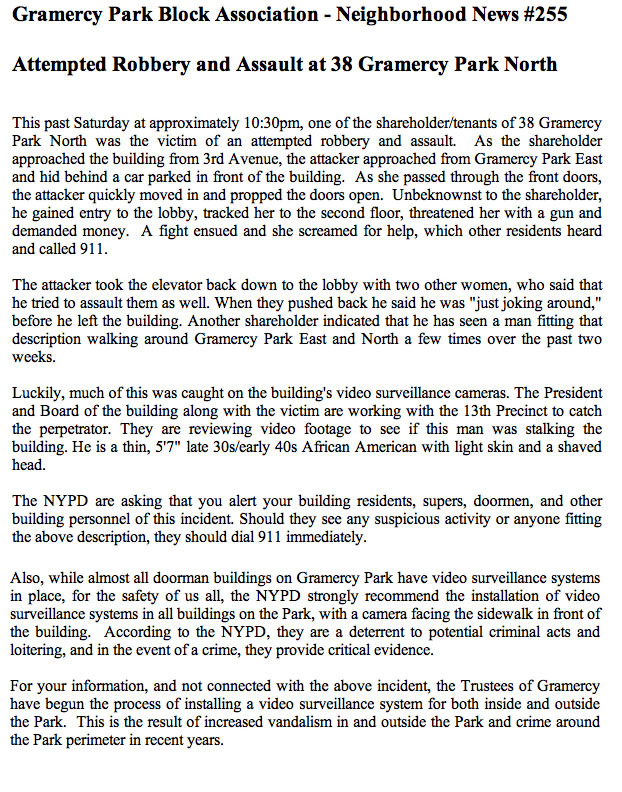 Many of our buildings on Gramercy Park have video surveillance ...Click here to read more. Some of Manhattan's wealthiest neighborhoods are exploding in a wave of violent crime that hearkens back to the bad old days when people feared ...Click here to read more. The 13th Precinct Community Council will host its monthly meeting on Tuesday, April 16th at 6:30pm. The meeting is open to the public, and officers from ...Click here to read more. The 13th Precinct continues to see crime increases, especially in burglaries and grand larcenies, Deputy Inspector David Ehrenberg said ...Click here to read more. The 13th Precinct Community Council will host its monthly meeting on Tuesday, March 19th at 6:30pm. The meeting is open to the public, and officers from the 13th Precinct will give you updates on ...Click here to read more. Several Gramercy Park building presidents and building owners have recently contacted me for recommendations for video surveillance companies ...Click here to read more. Burglaries, including those committed by "office creepers" are on the rise in the 13th Precinct, the precinct's commanding officer, Deputy Inspector Ted Berntsen ...Click here to read the full story. Police have released security footage in last week's gunpoint attack on a Gramercy Park woman. The grainy film shows a middle-aged, black male walking in front ...Click here to read the full story. 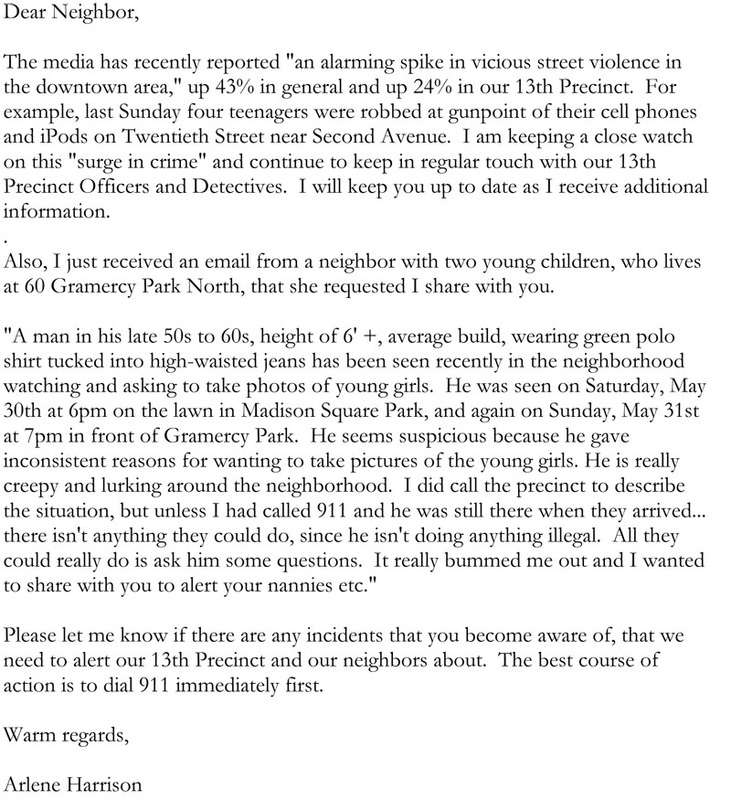 The NYPD have requested that you post this in your building lobby and show it to your building personnel ...Click here to see the flyer. 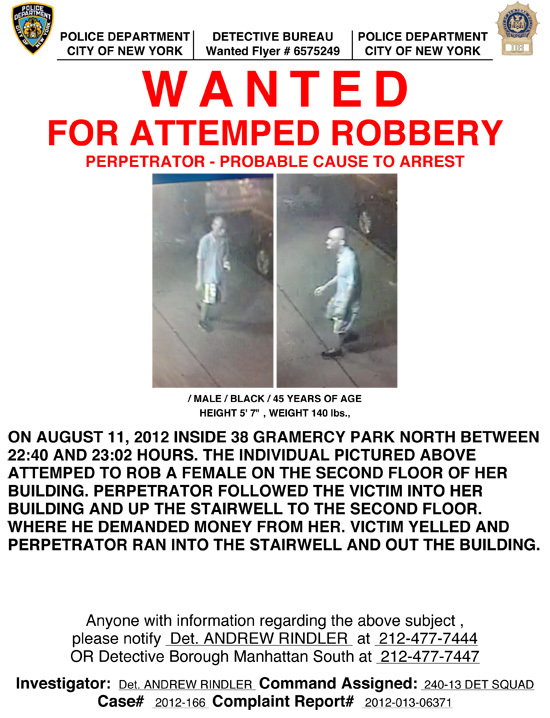 This past Saturday at approximately 10:30pm, one of the shareholders/tenants of 38 Gramercy Park North was the victim of an attempted robbery and assault. As the shareholder approached the building from 3rd Avenue, the attacker approached from Gramercy Park ... Click here to read the full story. The Gramercy Park Block Association invites you to join your neighbors for an evening of fun, food, and music! The 13th Precinct's National Night Out Against Crime. Tuesday, August 7, 2012, 5:00 PM - 8:00PM, The Playground of JHS 104, Second Avenue, Between 20th and 21st Streets ...Click here to read the full story. Please join with the officers of the 13th Precinct and the family of Police Officer Anthony Sanchez for a Memorial Mass for Anthony this Saturday, June 2nd ...Click here to read the full story. This Saturday marks the 15th anniversary of the death of the highly decorated 13th Precinct Police Officer Anthony Sanchez, who was killed answering a robbery ...Click here to read the full story. The Police Officers of the 13th Precinct held their Annual Family Christmas Party on Saturday, December 3rd at Epiphany Church's Monsignor Farriker ...Click here to read the full story. Lieutenant Larry Serras and Detectives James Coll, Keith Conelly, Pete Keszthelyi, Bobby Mierfield and Pete Quinn to the rescue. To see NY 1 News video coverage of Tuesday's East River helicopter crash and rescue, which includes interviews with our friends from ESU Truck #1, click here. To read a story about the rescue in the NY Post, click here. 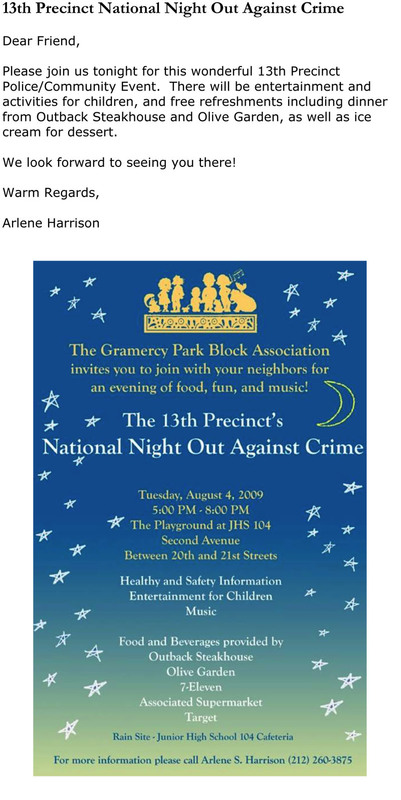 Last week, an article about the 13th Precinct's National Night Out Against Crime appeared in Town & Village newspaper. Many of our neighbors enjoyed the ...Click here to read the full story. The Gramercy Park Block Association invites you to join your neighbors for an evening of food, fun and music! 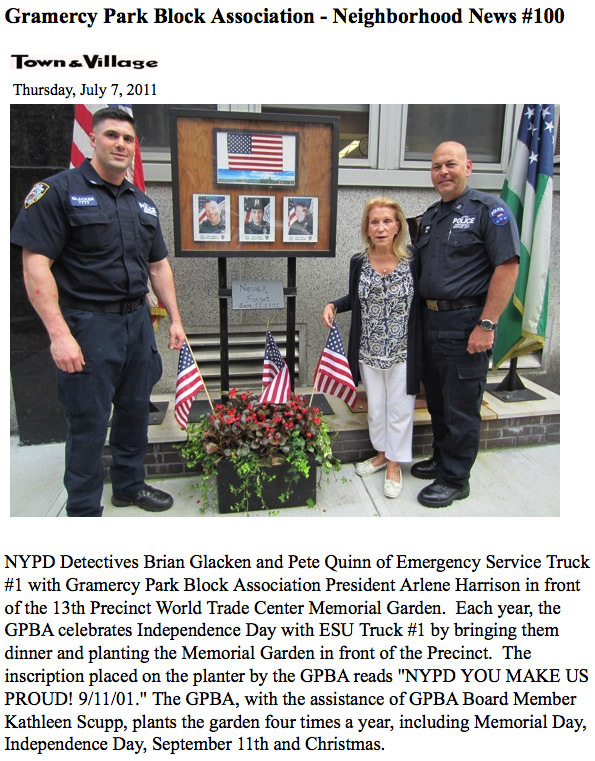 NYPD Detectives Brian Glacken and Pete Quinn of Emergency Service Truck #1 with Gramercy Park Block Association President Arlene Harrison in front of ...Click here to read the full story. Today marks the 14th anniversary of the death of the highly decorated 13th Precinct Police Officer Anthony Sanchez, who was killed answering a robbery ...Click here to read the full story. 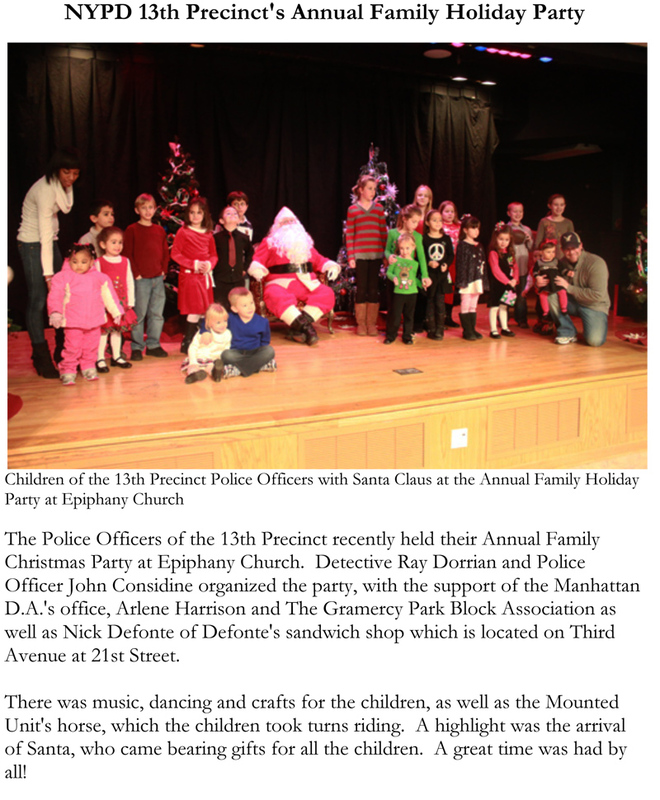 The Police Officers of the 13th Precinct recently held their Annual Family Christmas Party at Epiphany Church. Detective Ray Dorrian and Police Officer John Consodine ...Click here to read the full story. Please join us tonight, when the Gramercy Park Block Association will be a sponsor of the 13th Precinct's National Night Out Against Crime. This year, Shake Shack will join Outback Steakhouse and Olive Garden, who have served hundeds of free meals at ...Click here to read the full story. When members of the elite NYPD Emergency Service Unit Truck #1, headquartered on East 21st Street between Second and Third Avenues, recently returned from Haiti ...Click here to read the full story. 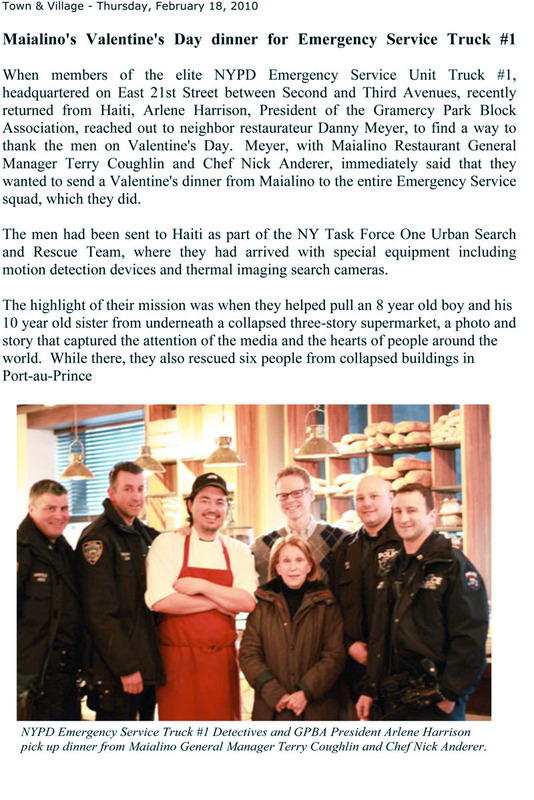 We are extremely proud of our men in the elite NYPD Emergency Service Unit Truck #1, who recently returned from Haiti. Five members of Truck #1, including Sgt. Mike McGinnis, Det. Jim Coll, Det. Andy Bershad, Det. Sean Mulchahy and Det. Soeren Lygum, were ...Click here to read the full story. 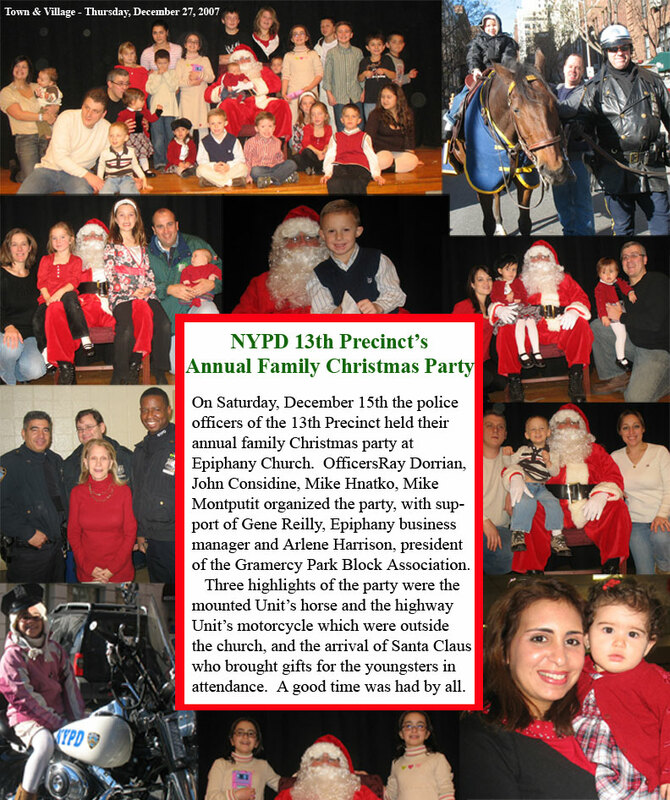 The Police Officers of the 13th Precinct recently held their Annual Family Christmas Party at Epiphany Church. Police Officers Ray Dorrian and John Considine ...Click here to read the full story. Once again, members of the GPBA led by Block Association President Arlene Harrison, and Event Chair Kathleen Scupp brought the spirit of Thanksgiving ...Click here to read the full story. Please join us tonight for this wonderful 13th Precinct Police/Community Event. There will be entertainment and activities for children, and free refreshments including dinner from Outback Steakhouse and Olive Garden, as well as ice cream for desert. We look forward to seeing...Click here to read the full story. The media has recently reported "an alarming spike in vicious street violence in the downtown area," up 43% in general and up 24% in our 13th Precinct. For example, last Sunday four teenagers were robbed at gunpoint of their cell phones and iPods on Twentieth Street near ...Click here to read the full story. 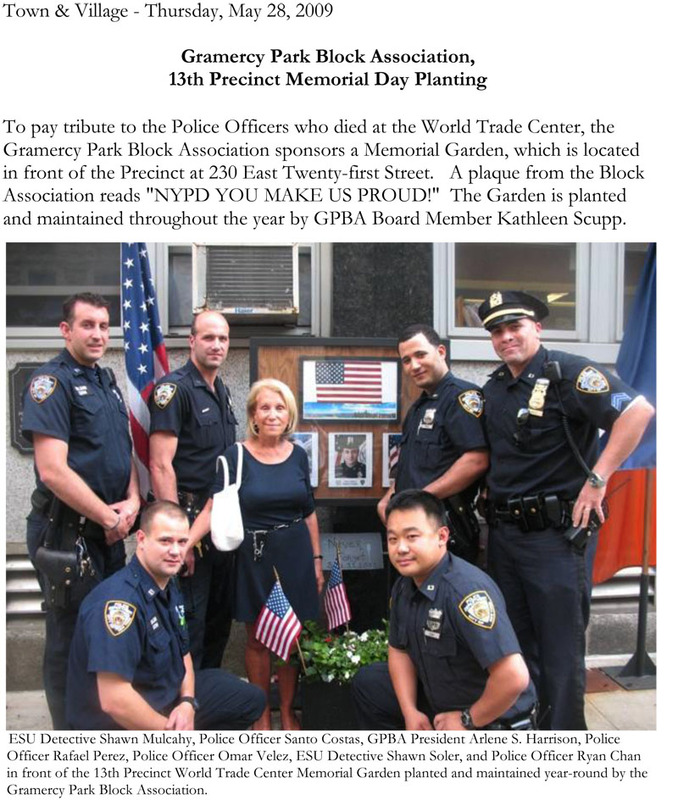 To pay tribute to the Police Officers who died at the World Trade Center, the Gramercy Park Block Association sponsors a Memorial Garden, which is located in front ...Click here to read the full story. NYPD Emergency Service Truck #1's Annual Family Christmas party was held at Epiphany Church on Saturday, December ...Click here to read the full story. On Saturday, December 6th the Police Officers of the 13th Precinct held their Annual Family Christmas Party at Epiphany Church. Police Officers Ray ...Click here to read the full story. The Gramercy Park Block Association working with the Police Officers of the 13th Precinct will once again be a sponsor ...Click here to read the full story. 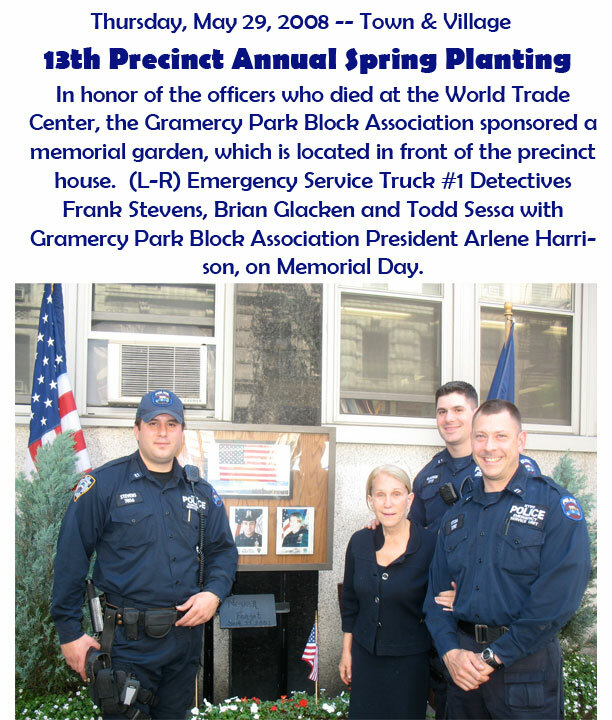 In honor of the officers who died at the World Trade Center, the Gramercy Park Block Association sponsored a memorial garden ...Click here to read the full story. On Saturday, December 15th the police officers of the 13th Precinct held their annual family Christmas party at Epiphany Church ...Click here to read the full story. NYPD Emergency Service Truck #1's annual family holiday party was held at Epiphany Church on Saturday, December 8th ...Click here to read the full story. Gramercy Park Block Association President Arlene Harrison and event coordinator Kathleen Scupp served Thanksgiving dinner to NYPD Emergency Service Truck #1, on Thursday. ...Click here to read full story. NYPD Emergency Service Truck #1 annual children's Christmas Party was held at Epiphany Church on Saturday, Dec. 9 ...Click here to read the full article. The police officers of the 13th Precinct held their annual family Christmas Party at Epiphany Church on Saturday, December 2 ...Click here to read the full article. Even temperatures that soared to three digits numbers and a humidity level that made the Big Apple feel more like a big sauna weren't enough to keep community residents away from the 23rd annual National Night Out Against Crime on Tuesday ...Click here to read full article. Arlene Harrison, president on the Gramercy Park Block Association and Police Officers Jacob Habib, Sandra Quiones, and Ernesto Troche take part in the annual ...Click here to read full article. NYPD Emergency Service Truck #1's annual children's Christmas party was held at Epiphany Church on Saturday, December 10th. The event was organized by the ...Click here to read the full article. On Saturday, December 3rd, the Police Officers of the 13th Precinct held their annual Family Christmas Party at Epiphany Church. The party was organized by Police Officers Benny ...Click here to read the full article. The 2005 retirement party for Emergency Service Truck #1 ...Click here to view photo. An eight-year-old boy with cerebral palsy whose lifelong dream was to spend a day with New York Police Officers had his wish come true when he visited the 13th Precinct and the Emergency Service Unit ...Click here to read the full article. Children who've dreamed of playing cops and robbers for real got to fulfill their fantasies on Tuesday, at the 22nd annual National...Click here to read the full article. "I was shocked and very upset by the allegations made against some 13th Precinct Police Officers," said Arlene Harrison, President of the Gramercy Park Block Association, a group that has ...Click here to read the full article. NYPD Emergency Service Truck #1 's annual children's Christmas party was held at Epiphany Church on Saturday, December 18th. The event was organized ...Click here to read the full article. On Saturday, December 11th, the police officers of the 13th Precinct held their annual children's Christmas party at Epiphany Church. The party was organized by police officers Ray Dorian, Joe ... Click here to find out more. Hundreds of residents and dozens of community organizations turned out on Tuesday evening to participate in the 21st annual National Night Out Against Crime, organized by the friends of the 13th Precinct at ... Click here to find out more. 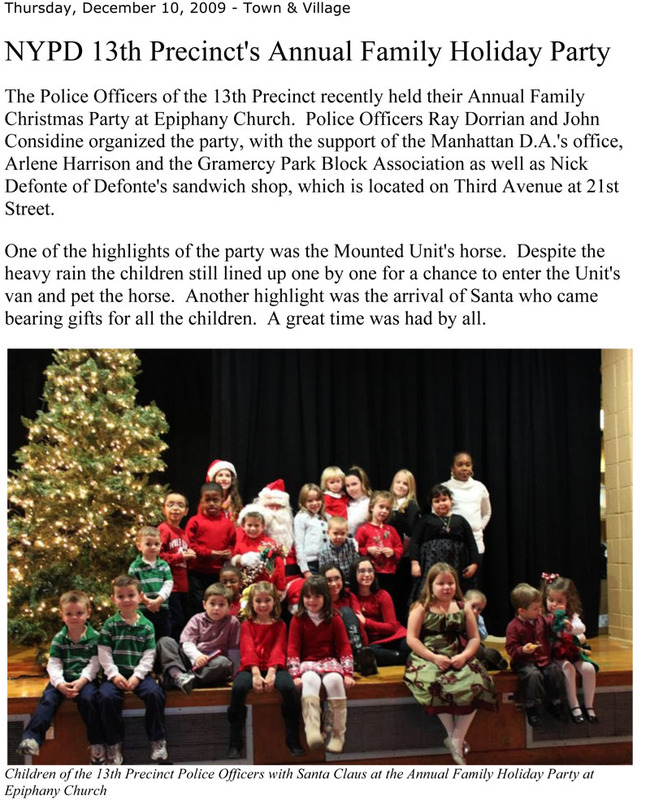 NYPD Emergency Service Truck #1's children's Christmas party took place at Epiphany Church. The party was attended by 75 children whose parents are all NYPD Police Officers. Arlene Harrison, ... Click here to find out more. The 2003 retirement party for Emergency Service Truck #1 ...Click here to view photo. The Gramercy Park Block Association provided children's identification kits for neighborhood families. Three of New York's Finest were memorialized last week during an emotionally charged ceremony at the East 21st Street home of one of the department's elite Emergency Service ...Click here to read the full article. The 13th Precinct and the Police Academy located on East 21st and East 20th Street, dedicated last week to honoring the police who put other people's lives before their ...Click here to read the full article. The 2002 retirement party for Emergency Service Truck #1 ...Click here to view photos. One of the city's most successful restaurateurs rolled out the red carpet for his local heroes last week. Danny Meyer - owner of Union Square Cafe, Eleven Madison Park, Gramercy Tavern and ...Click here to read the full story. The GPBA/13th Police Precinct Partnership was founded in 1994 by Arlene S. Harrison after her then fifteen-year-old son was savagely beaten in an unprovoked attack outside her home. In an ...Click here to read the full story. 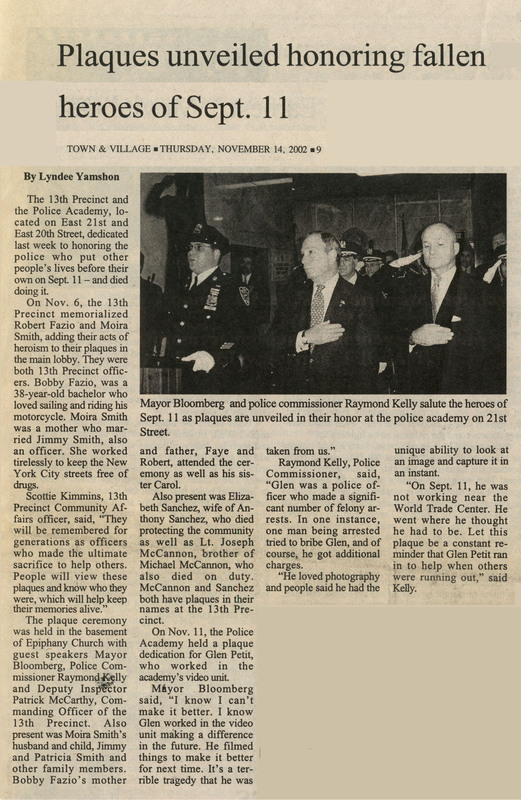 The Epiphany Parish and 13th Precinct honored the memory of Sgt. Maureen Kirwan recently. Kirwan, the creator of the ...Click here to read the full story. Arlene S. Harrison, President of the Gramercy Park Block Association, welcomed more than 100 community leaders, ...Click here to find out more. The 13th Precinct was a somber place this week following the death of police officer Anthony Sanchez ... Full story here. The officers at the 13th Precinct have a new secret weapon that allows them to sneak up on the bad guys. Believe it or not its called a bicycle. The 13th Precinct has put a whole fleet of them on the streets in ...Click here to read the full story. Two recent rulings by the New York State Office of Alcoholism and Substance Abuse Services could prove to be the biggest weapons the 13th Precinct Police have in keeping drug dealers off our street corners ...Click here to read the full story. In a pouring rain and the basic training hour of 6am, the intrepid 13th Precinct Explorers, 13-17 year-olds with an interest in a career in law enforcement, boarded a ...Click here to read the full story.